A vintage Bean at Fields Garages Ltd of Chichester. Homepage. 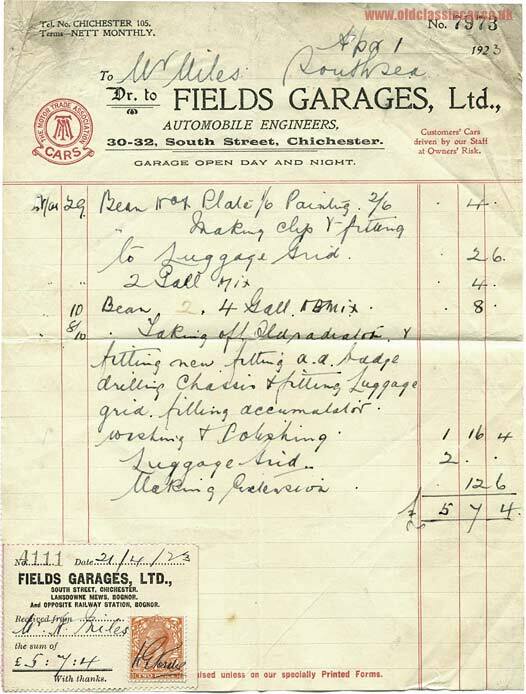 This page: A fragile old invoice detailing work done to a vintage Bean motor-car in 1923. Work done to a Bean at an Automobile Engineers in Chichester. This ancient invoice was printed on tissue-thin paper, and dates to April 1st 1923. It describes the work done by Fields Garages Ltd (Automobile Engineers) to a Mr Miles' Bean motor-car. Fields had garage premises at Lansdowne Mews in Bognor Regis, plus another site opposite the railway station in the same town, and also at 30-32 South Street, Chichester, which is where this particular invoice was raised. These engineers were members of the MTA (Motor Trade Association), and were open night and day. On the 8th March, a new radiator was fitted to the Bean, along with an A.A. badge. The rear chassis was also drilled, ready for the fitment of a new luggage grid. A new accumulator (ie battery) was also fitted at this time, and the car washed and polished prior to being collected by Mr Miles and driven back home to Southsea. On the 10th, Fields' sold him four gallons of Mix (motor spirit), and on the 29th the car returned to the workshop for a little more work to be done. A new number plate was affixed to the luggage rack, with new specially-made clips. Two more gallons of Mix were also sold. The model of Bean isn't specified, although being of the early 1920s at the latest it probably was not dissimilar to this example, seen at a recent VSCC sprint meeting. Return to the Motoring Collectables section for more items relating to pre-war cars and garages. Another item of paperwork in this section refers to a garage in Carlisle that was, amongst other things, the official (sole) distributor of Bean motor-cars and trucks in Cumberland.